Today let’s talk about literature selections for Magic Kingdom. There are a plethora of stories in this park . We read the stories as read alouds during our homeschool time or listened to the audio version . Jim Dale does an amazing audiobook for Alice’s Adventures in Wonderland and Peter Pan . Highly suggest them for while you are driving to Disney or on a long road trip. After reading the stories, we watched the Disney movies to see how they compared. The next time we visited Magic Kingdom, we sought out those characters or rode the ride it pertained to and did another comparison between the actual story and the Disney version. Walking through the Swiss Family Treehouse was fun as was playing on Tom Sawyer Island. The children had a new appreciation for the attractions now that they understood the background better. Want a unit study or printable to go with the books? 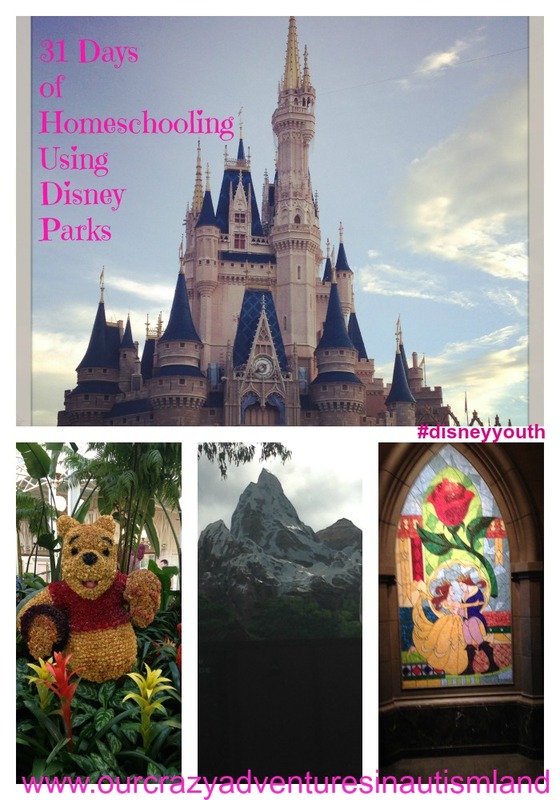 I have several pinned on to my Homeschooling Using Disney Parks board. Hop on over and check them out. Disclosure: By purchasing using the links above, you are helping me to pay for our Disney annual passes where we can play and learn. We appreciate it and always hope that we make enough to buy a Mickey bar too. Thanks! Hey I love this. My son is almost 10 months and soon enough would be reading. This is some great information I can use. Here from UBC by the way. Cheers! Thanks for visiting! These would be great for your son. Every small child loves Winnie the Pooh and the stories are so cute! Start there for sure. My adult daughter is still a Disney fan and loves to watch our old Disney movies with her daughter. A great idea to read the books and compare. I’m so glad you have a Disney fan in your midst. This will be a great series for her! Please share. Hi~ Visiting from UBC! LOVE this post though. I love Disney and homeschooled our son all 12 yeas of education. He would have loved some Disney themed curriculum. What a neat idea! Thanks! My kids certainly enjoy it. Your idea of reading the books aloud and listening to audios then going to Disneyland is fabulous, what better learning can there be. I still enjoy those books too. Great sharing. Thanks! They are great books! Such good stories. How to make it come alive!